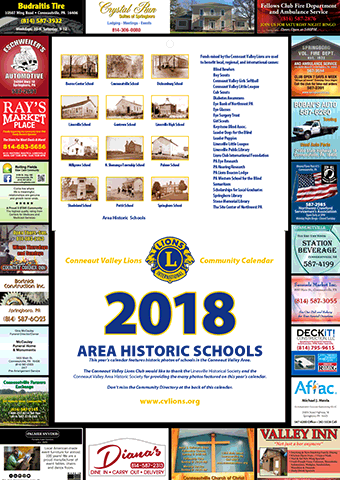 The Conneaut Valley Lions club is continuing the tradition of a Community Calendar for 2018. Advertising space is limited. The deadline for advertisers and calendar dates is November 1, 2017. Calendars will be arriving for distribution near December 1, 2017. 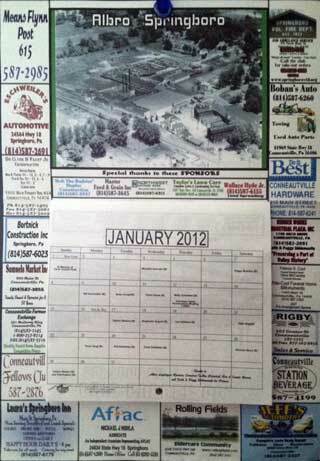 The Conneaut Valley Lions club is continuing the tradition of a Community Calendar for 2015. The theme for this calendar will be Volunteers. This should be a very special calendar, when you consider how important volunteer organizations are to the Conneaut Valley. If you are involved in a volunteer organization and would like to be considered for the 2015 Community Calendar, please contact Donald Wheaton with an interesting, high-resolution photo that could be used for one of the months of the calendar. Pre-paid calendars cost $10 and include 1-free date to use toward listing a Birthday, Anniversary, Meeting, or Memorial event date. Additional dates are $2 or 12-dates for $20. Dates are a great way to let the entire community celebrate your event, for less than the cost of a Hallmark card. Advertising space is limited. The deadline for advertisers and calendar dates is November 1, 2014. Calendars will be arriving for distribution near December 1, 2014. 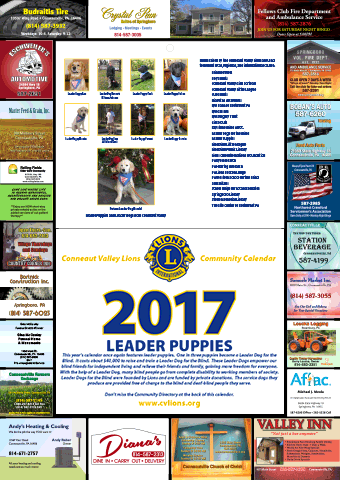 The Conneaut Valley Lions club is continuing the tradition of a Community Calendar for 2017. Advertising space is limited. The deadline for advertisers and calendar dates is November 1, 2016. 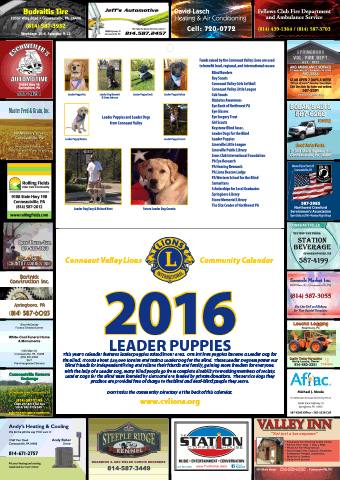 Calendars will be arriving for distribution near December 1, 2016. Here are the photos featured on the Lions 2014 Community Calendar. 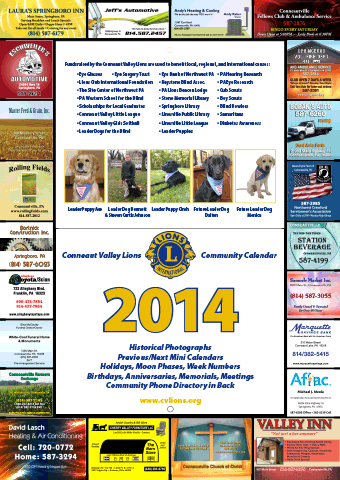 The Conneaut Valley Lions club is continuing the tradition of a Community Calendar for 2014. The theme for this calendar will be Then and Now. Pre-paid calendars cost $10 and include 1-free line to use toward listing a Birthday, Anniversary, Meeting, or Memorial event date. Advertisers have sponsored the calendar. The deadline for advertisers and event dates is November 1, 2013. Calendars will be arriving for distribution December 1, 2013. You can list events on the 2014 Community Calendar. The type of event determines how many lines we estimate the event will require. Rather than counting characters, our line estimate determines the price for the event. Some events may require more or fewer lines than our estimate, but the pricing remains the same. Sponsors will get 1-free line for every $10 of advertising they purchase. Pre-paid calendars include 1-free line. If someone purchases two calendars, they would get 2-lines for free and they could list 2-birthdays, 1-anniversary, or 1-memorial. If someone purchases one calendar, they would get 1-line for free. If they wanted to list 5-birthdays and 1-anniversary, they would need a total of 7-lines. They should purchase 10 additional lines for $10. If a church wanted to list four dinners they plan to hold during 2014, they would need 12-lines. The cost of their event dates would be $14: 10-lines for $10 and 2-lines for $4. The following PDF shows an approximate layout for the 2015 Calendar. The overall size is about 13x19 inches. There are several positions and sizes available to advertisors. The sizes are color-coded: all positions with the same color are the same size. All ads appear for the entire calendar year. The following PDF shows an approximate layout for the 2014 Calendar. The overall size is about 13x19 inches. There are several positions and sizes available to advertisors. The sizes are color-coded: all positions with the same color are the same size. With the exception of the Sposored Photos, all ads appear for the entire calendar year. In addition to their ad and 1-free calendar, sponsors also get 1-free event line per $10 of advertising. For example, the $100 Square Ad would get 10-free lines to list dates on the calendar.